On Monday, June 20th the CAUSE Leadership Academy kicked off the Civic Leadership Session series! This year, each week’s themes will educate us about different Asian Pacific American communities so we may understand the current issues facing each respective community. We began by learning about the Chinese American community. After the meeting with CACA, we continued the day with learning about the importance of local government and how to advocate for the Chinese American Community. The Honorable Polly Low, Mayor Pro Tem, City of Rosemead, gave us the privilege of being our speaker at lunch! Mayor Pro Tem Low is unique in that she initially did not want to go into politics, but she ended up running for office because she saw her community’s need for an advocate. Throughout her tenure in office, Mayor Pro Tem Low has stuck to her core values and provided transparency for her constituents as well as her fellow legislators. She places the needs of her constituents first and always considers how each decision she makes affects each community in Rosemead. Her emphasis on a person’s capabilities and ambition allows her to work with everyone—a skill needed in any work environment and in any well-functioning society. 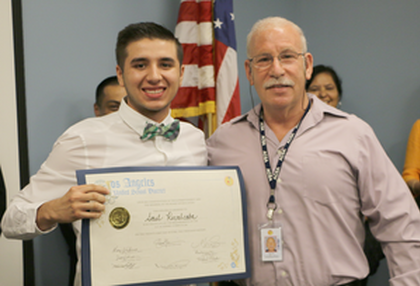 I also started my placement at the office of Los Angeles Unified School District Board (LAUSD) member Scott Schmerelson’s office this week! 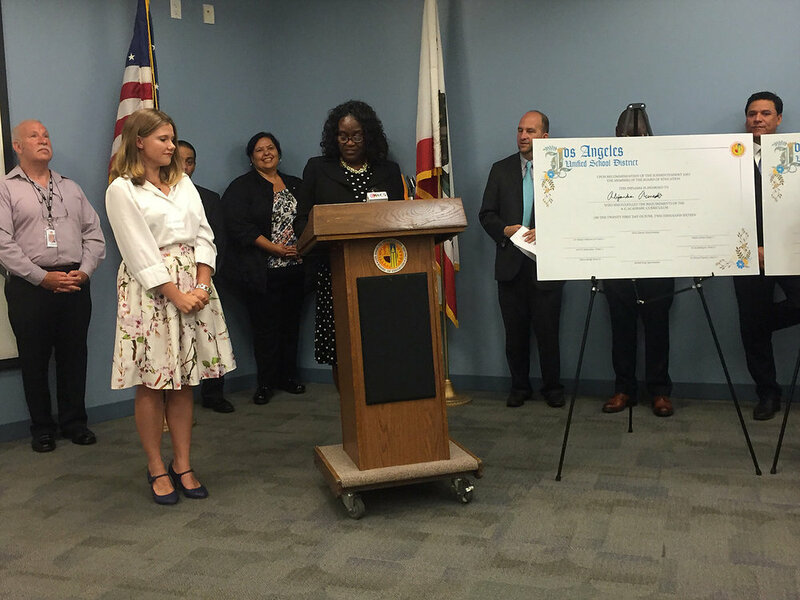 I began my internship by attending a press conference promoting the success of the A-G requirement in LAUSD schools. A-G requirements are core classes that colleges entering students to have completed. Up until a couple of years ago, the schools did not have nor implemented A-G requirement policies. At the event, LAUSD Superintendent Michelle King spoke about how schools had valedictorians who were ineligible to apply to California State Universities and the University of California system because they did not fulfill the A-G requirements. “I talk about A-G—what it is and why it’s important for our kids to have it. It is a part of a rigorous and high-quality education that prepares them for life after high school, she said The event was held to celebrate one of the first classes of students who were eligible and were accepted to four year universities including: CSULA, UCLA, and Yale. LAUSD has continued to overcome adversities and a large lack of funding for its 900+ schools and 640,000+ students. LAUSD emphasizes the relationship between home and school. Their goals are simple but the impact is crucial to a student’s success. Towards the end of the week, I got to visit Gratts Elementary School, one of the high achieving schools in LAUSD due to the CORE Waiver and Title 1 program. When I walked in I immediately fell in love and was reminded of why I chose to pursue education. The children were learning a lesson about the history of Jazz—its culture, contributors, and impact. Though the students were young, they were beginning to learn how to write Cornell notes. The educator in the class emphasized grasping the main concepts rather than focusing on complete thoughts and proper grammar. All around the classrooms were posters that reiterated lessons that students could refer back to for reference as well as portraits and student work that helped the students claim the new summer school class as their own. Seeing the teachers love what they do and inspire students to succeed despite various challenges and a lack of funding reignited my own passion.